The diagram gives the impression that if you're a white person (in USA), then you're about equally likely to be murdered by a black person as by a white person. How does one reconcile the diagram with the Justice Department's data? Does it have to do with "per 1,000,000 members of murderer's race"? If so, can anybody explain the math? 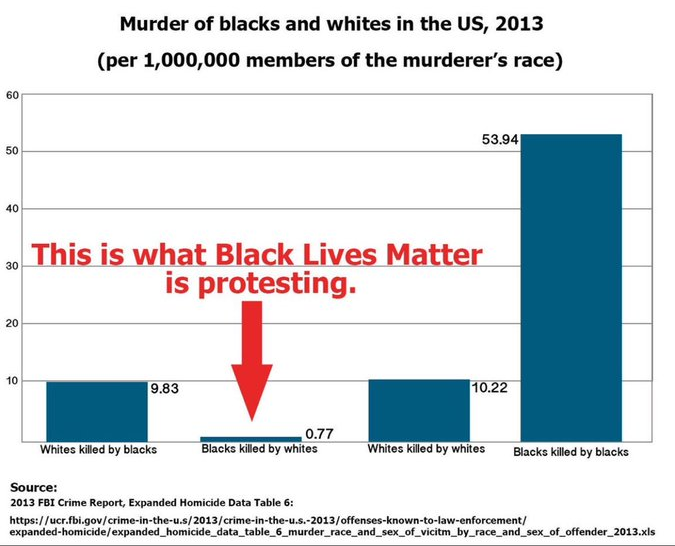 As others have said, this image misrepresents what the Black Lives Matter movement protests. As a general rule, police shootings don't appear in crime statistics as most are considered justifiable. That's the basic Black Lives Matters complaint. That police shootings of black decedents are overwhelmingly marked as justified. Note that according to the Washington Post, 258 black decedents were shot by police officers in the year they studied. I'll leave it up to you if you want to do the math to compare to the other numbers from the image. That said, there seems to be a separate claim in this question, unrelated to the point that the image was trying to make: That whites are as likely to be killed by blacks as other whites. This is a false claim based on a misinterpretation of what the image shows. The image is showing Expanded Homicide Data Table 6 as the source of the data. So let's look at that data directly. These results are different from the image, so it's likely that it used different base numbers for population. They are similar though, so I believe this is the methodology they used. So, these are results of a calculation, not falsified. They may be slightly inaccurate in that it seems that they are using a source other than the 2013 census data. Note that I'm doing this math not to make any claims, but simply to explain how the calculations worked. That impression is incorrect. If we go back to the raw data, 2509 white victims were killed by whites and 409 by blacks. So a white murder victim was about six times more likely to be killed by another white person than a black person. The diagram adjusts for population. One of the problems with these kinds of comparisons is that there are about six times as many whites as blacks. So looking at the raw data will produce higher numbers for whites than blacks on almost any measure. So it is common to normalize the data so as to make the statistics more comparable. Describing the resulting statistic is complicated, particularly in this case. Perhaps we might say that a black murderer with a white victim is about as common among blacks as a white murderer with a white victim is among whites. I.e. about ten (rounded up from 9.94) in a million whites murder a white person and about 9 (rounded down from 9.09) in a million blacks murder a white person. Be careful though, as people can easily misinterpret statistics like that. And of course this entirely ignores the possibility that a single person murdered multiple victims. Not the answer you're looking for? Browse other questions tagged united-states criminology violence racism .